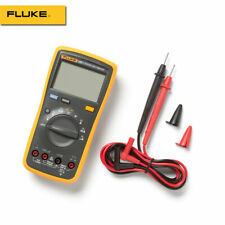 Fluke Connect 3000FC Digital Multimeter. Measurement Range from 0.5A to 400A. Jaw Capacity: 17mm. DC Current (A): 2A/20A/100A ±(2% 3). AC Current (A): 2A/20A/100A ±(2.5% 5). LCD Size: 39.3mm 21.5 mm. Product Size: 175mm 60mm 33.5mm. We believe in communication. 1 English User Manual. Capacitance: 200F / 20F / 2F / 200nF / 20nF. Fuse Protection: 250V / 0.2A. Resistance: 200 / 2K / 20K / 200K / 2M / 20M / 200M. DC Current: 2mA / 20mA / 200mA / 20A. AC Current: 2mA / 20mA / 200mA / 20A. 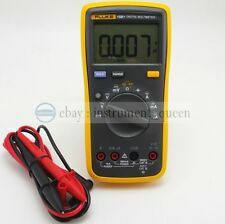 Fluke 101 Basic Pocket Digital Multimeter Genuine English Ver with TRACK NUMBER! Basic dc accuracy 0.5%. Diode and continuity test with buzzer. Vac Range : 600.0V. Vdc Range: 600.0V. Ohms Range: 40 M Ohms. Small lightweight design for one-handed use. Size: 130 mm x 65mm x 27mm. General Specification. LCD display size: 35x14mm. LCD maximum display value: 1999. On-off detection and buzzer function: Yes. If item is defective after 3 months, you can still send it back to us. We will send you a new one after receiving the defective item. Product Size: 17.4cm x 7.9cm x 4.7cm. DC Current: 600μA/6000μA/60mA/600mA/6A/10A /-(0.7% 2), AC Current Relative Mode, MAX/MIN, LCD Backlight, Input Impedance for DCV(1GΩ Max). 2 x Test leads. We believe in communication. Insulation Piercing Clip Set, Banana Jack Accepts Banana Plug Leads with rigis insulation sleeve, Color: Red, Black, Length 4 In" (143cm), Stainless Steel Probe Pierces Insulation on Gauge Wire, Tip Material Stainless Steel, For Use With Banana Plug Test Leads, Accepts 4mm Banana Plugs, Includes (1) Red and (1)Black Probe. DC current: 400μA/4000μA/40mA400mA/4A/10A. AC current: 400μA/4000μA/40mA/400mA/4A/10A. Diode test: √. Auto/Manual Range: Auto. Data retention: √. Maximum reading: 3999. Short circuit beep: √. Case top opens laterally to allow use of test tool without removing it from the case and includes a strap to secure the test tool. Durable polyester 600D case construction for long life. Type-K thermocouple with standard shrouded banana jack. Convenient one piece construction. Jaw Capacity: 17mm. Zero Mode: √. DC Current (A): 2A/20A/100A ±(2% 3). AC Current (A): 2A/20A/100A ±(2.5% 5). LCD Size: 39.3mm 21.5 mm. Product Size: 175mm 60mm 33.5mm. We believe in communication. The new soft case is designed for Fluke T5-1000,T5-600,T6-600,T6-1000. The length:8cm, the width:5cm, the height: 26cm (3.15in 1.97in 10.2in). Doulbe Zipper. Shock protection. Model: UT204A. Jaw Capacity: 28mm. DC Current (A): 40A/600A ±(2.5% 5). AC Current (A): 40A/600A ±(2.5% 5). Product Size: 208mm 76mm 30 mm. We believe in communication. Detail Images. 1 English Manual. (Capacitance (F): 2nF/20nF/200nF/2μF/20μF/200μF/2mF/20mF ±（4% 5). DC Current (A): 20A/200A ±（2% 3). AC Current (A): 20A/200A ±（2.5% 8). Resistance (Ω): 200Ω/2KΩ/20KΩ/200KΩ/2MΩ/20MΩ ±（1% 2). LCD Size: 39.3mm × 26.5 mm. Want more accurate range display as 9999 counts, leading top of current technology?. It can also test capacitance, frequency, duty cycle, diode and continuity. Backlight LCD for easy operation in dimly lit areas. Model: UT15C. Resistance: 0~400KΩ. Product Net Weight: 210g. Product Color: Red and Grey. We believe in communication. Phase Rotation Test Product Size: 275mm 51mm 30 mm. 400V 300V±30V. This is a new batch and useful for repairing a faulty connection causing a faded display. The LCD is not included. Fluke 87iii. LCD Display with Backlight, Convenient to Operate and Read. Auto Power off Function. Maximum Display Value: 2000. Max Clamp Opening Size: 30mm / 1.2in. EASY TO USE AND READ: Small and Portable to Carry and Use. Capacitance (F): 2nF, 20nF, 200nF, 2uF, 200uF. Fuse proteciton: F 200mA/250V. COMS integrated circuit, the principle of double integral A/D conversion. Has a large LCD screen. Resistance (Ohm): 200, 2k, 20k, 200k, 2M, 20M, 200M, 2000M. Suitable for FLUKE, HIOKI, TESTO. Solves almost any hanging and positioning problem you may face, practical and convenient. Anyway we will try our best to avoid this kind of thing. Due to the light and screen difference, the item's color may be slightly different from the pictures. Model: AN101. Display: LCD, 1999 counts updates 2/sec. LCD size: approx. DC Current AC Current 200mA, 100µA. 2000µA, 1µA. 200µA, 0.1µA, ±(1.0% of rdg 5dgts). Trending at C $13.12eBay determines this price through a machine-learned model of the product's sale prices within the last 90 days. Model: UT120A. Input Impedance for DCV: Around 10MΩ. General Characteristic Relative Mode: √. Display Count: 4000. Resistance (Ω): 400Ω/4KΩ/40KΩ/400KΩ/4MΩ/40MΩ ±(1% 2). Auto Range: √. Data Hold: √. Suitable for FLUKE, HIOKI, TESTO. 1 x Hanging Loop Strap & Magnet Hanger Kit. Hanging Strap And Magnet Kit only, other accessories demo in the picture is not included! Solves almost any hanging and positioning problem you may face, practical and convenient. Hertz Test: 200KHz. DC Current: 2mA-20A Accuracy: ±(0.5% 1dgt). AC Current: 20mA-20A Accuracy: ±(1.0% 3dgt). Temperature Test: -40°C-1000°C. 1 x Temperature Sensor Cable. Due to the different display and different light, the picture may not reflect the actual color of the item. (3)DC current：20mA(±1.5% 5),200mA(±1.2% 5)(4)AC current：20mA(±2.0% 5),200mA(±1.5% 5). AC current：0.1uA to 200mA. DC current：0.1uA to 200mA. Auto ranges. Repairs will be processed through the manufacturer, we will assist in the repair procedure in any way we can to expedite the process. Case top opens laterally to allow use of test tool without removing it from the case and includes a strap to secure the test tool. 1 x Soft case the big one. Durable polyester 600D case construction for long life. Fluke 189 TRMS Multimeter w/Logging, New Input Jacks, Perfect Working Condition! Digital and analog multimeters let you test a variety of electrical tools, appliances, and circuits. 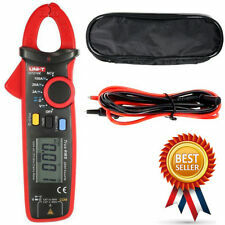 These devices allow you to check voltage, resistance, and many other values. Whether you need a model for small tasks or models for big commercial jobs, digital and analog multimeters give you the tools you need. 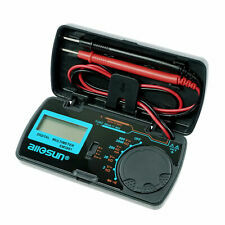 What are the basic types of multimeters? Multimeters are electronic tools that you use to test various electrical values, such as voltage, resistance, capacitance, and current. The two basic kinds of meters are analog and digital. Analog meters use graphic readouts called ammeters to give you information. The ammeter uses a needle and a dial to represent various functions and values. Digital multimeters use LCD digital readouts to give you data. They present the values as whole numbers on the screen, a factor that makes reading them simple. What are the benefits of digital multimeters? Oscilloscope: These screens show frequency, amplitude, and other electromagnetic values. Automatic range finding: This feature picks the range and test category for you. Automatic polarity checking: This feature tells you if the voltages are positive or negative. 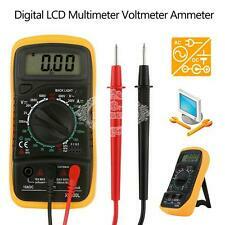 What should you look for in a digital multimeter? Different multimeter models bring different benefits to the table, and you should look for the following features in models that interest you. High resolution and accuracy: The resolution and accuracy levels let you know how finely they can measure electrical values. Much like video screens, the higher the resolution of your multimeter, the more detailed the data it gives you. With that in mind, you should choose models with the highest possible resolution and accuracy. Sensitivity: When you connect your meter to a source of current for testing, the meter itself affects the readings due to natural resistance. Sensitivity features give you feedback about the small fluctuations caused by your meter, making your overall calculations precise. What types of probes are there? Which electrical measurements can you make with digital multimeters? Testing direct current voltages: Most batteries use DC for power. Testing alternating current voltages: Most of your appliances use AC current. Testing resistance: You measure resistance in units of ohms. Lower test values mean lower resistance. Testing continuity: Electricity cannot pass through circuits with broken or damaged wires. 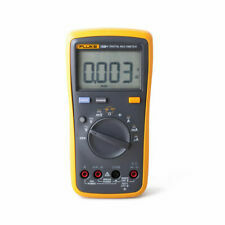 Your multimeter indicates this with the open circuit feature, or with the infinity symbol. In contrast to this, your multimeter gives you a closed circuit signal when all is well with your tests. 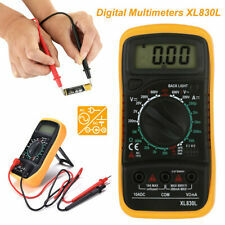 What are some things you can test with multimeters? 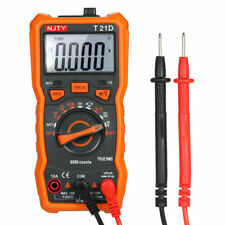 You can test most electric circuits and devices with your digital multimeter. For example, you can use your meter to test your toaster, blender, microwave, and other appliances. You can also use your meter to test larger objects like the wiring in your house, your car, or boat.